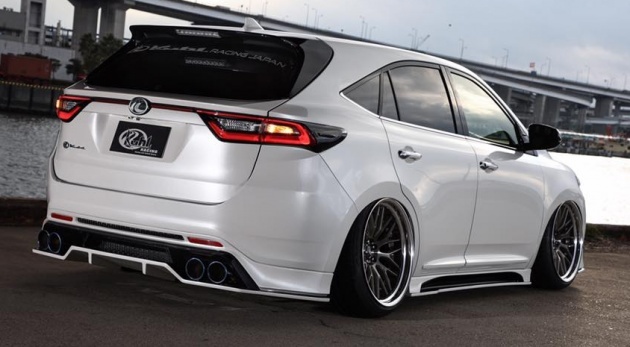 The folks over at Kuhl Racing have announced yet another creation for the 2018 Tokyo Auto Salon, this time using a Toyota Harrier as the base vehicle. As with most of their other modified vehicles like the C-HR and 86, you’ll either love it or hate it. For this project, the SUV has been “slammed” to the ground courtesy of revised suspension and plenty of negative camber on all four wheels. 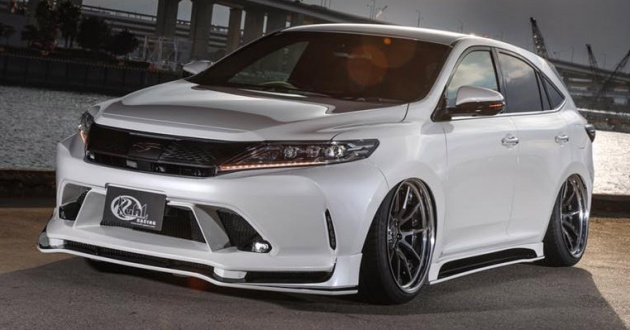 To go along with the large alloys, there’s an aggressive-looking body kit, which includes new bumpers, side skirts, rear diffuser and spoiler. Elsewhere, there’s a new front grille and a quad tailpipe setup. The body kit is available in two different grades – SG Type, which uses a special fibre-reinforced plastic (FRP) that is 1.5 times stronger than conventional FRP material, and a top grade HG Type. The second one uses the same material as SG Type, but achieves twice the strength by adding a newly developed cross mat. Prices start at 259,000 yen (RM9,326) for an unpainted SG Type kit, going up to 339,000 yen (RM12,196) if you want them painted. The HG Type goes for 329,000 yen (RM11,847) for an unpainted kit or 409,000 yen (RM14,728) with paint. OK OK I get it. The purpose of this “Kuhl” racing mods is ONLY for show. It does not add any speed or power. This is how to spend to look GUD for those who can afford to throw some $$$ away I guess !! Being hip. All’s bout same2 but Different. Actually it removes speed. If you drive this, you’ll be overtaken by pedestrians. Geriatric pedestrians. This isn’t a car, it’s a barely moving roadblock. Actually the prices are cheap in YEN. But the only problem, our Ringgit tak ada nilai. That is why it looks so expensive to buy this here. I wish one day our Ringgit will get stronger. looks like a sitting duck. Hell yeah…. but the first thing on malaysian road with this type of skirting will be a crack skirting over a bump. Previous Post: SPIED: C8 Audi A6 spotted – new production lamps?